Put-in-Bay Information helps you prepare for your summer vacation. We are a quiet fishing village located on South Bass Island in Ottawa County, Ohio, United States. One of many islands located in the western basin of Lake Erie, Put-in-Bay is by far the most popular destination for tourists. Most people agree that the name “Put in Bay” originated from the early nautical maps of South Bass Island. They showed the main harbor being named Pudding Bay because it was shaped like a pudding sack used by sailors. A pudding sack is exactly what it sounds like… a sack used to make puddings! 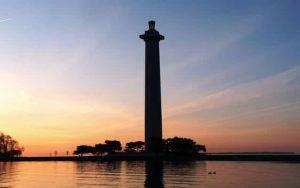 The official year-round population of Put-in-Bay Ohio was 128 as of the 2010 census. The graduating class of Put-in-Bay School averages 4 students. However, once the weather gets nice, the summer population swells into the thousands, with weekends seeing even more guests. The ferry services run extra boats to accommodate the huge influx of visitors who come for the bars, entertainment, and historical tourism. Golf Carts and Island Taxis also abound. Put-in-Bay played a major role in the War of 1812 between the US and England. The waters around Put-in-Bay were the location of United States Navy commander Oliver Hazard Perry. He sailed from the port of Put-in-Bay on September 10, 1813 to engage a British naval squadron commanded by Captain Robert Heriot Barclay just north of South Bass Island in the “Battle of Lake Erie”. Put-in-Bay is the most popular summer resort and recreation destination in Lake Erie. Two ferry services connect the island with the mainland. In addition, boats also run between Kelleys Island, Port Clinton, Middle Bass Island, Lorain, and Sandusky, Ohio. Hundreds of thousands of tourists make their way to Put-in-Bay every year and our Put-in-Bay Information helps out greatly! Our main tourist season starts in early April when our fishermen friends arrive from as far away as North Dakota. Finally, the season ends on Halloween weekend with Ohio’s biggest Halloween Costume Contest at Mr. Ed’s. 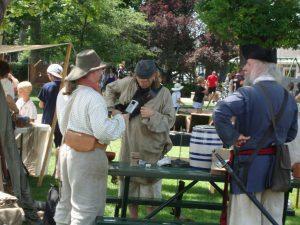 Other special events occur every weekend and a Put-in-Bay event schedule and calendar is available here on our website. Reservations are not required. Vehicles are taken on a first come, first serve basis. Vehicles can round trip within the same day on Monday, Tuesday, Wednesday, Thursday, or Friday. However, because of heavier traffic we are not able to round trip a vehicle within the same day on Saturday, Sunday or a Holiday Monday. During Spring & Fall Schedules -Vehicles must be in line before 4:00 pm Monday through Saturday and in line before 3:00 pm on Sundays and Holiday Mondays in order to be guaranteed passage off Put-in-Bay. During Summer Schedules -Vehicles must be in line before 6:00 pm Daily in order to be guaranteed passage off Put-in-Bay.